I spoke at a networking event recently where a lovely young lady (let’s call her Kate) was sharing with me her dream home that she is currently saving for. It was a unique home with an interesting style, and she was not going to settle for anything else – she was prepared to wait until the universe delivered this home! Now I am not one to squash the dreams of a young person who already had a great savings strategy (and habits in place) – but I am absolutely the person who will happily share a tip that could ensure that said dreams come true! I asked Kate what would happen if the universe delivered this property in her searches and she wasn’t ready financially? What would she do? Kate jokingly laughed and said that she trusted the universe to deliver it when she was ready BUT if you know me then you know I am all about making it happen. 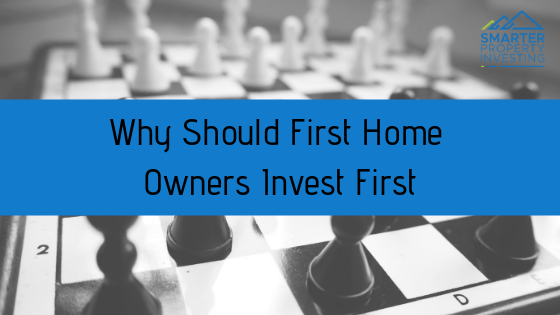 So, I started to explain to Kate why she should actually be buying an investment property FIRST, before her forever home. But, What About The First Home Owners Grant? I was ready for this quick fired common question – so I had my answer ready! The $10,000 that the Government currently pays First Home Owners is generally around the same amount of tax deductions in the first year of ownership, let alone the TENS of $1,000’s and in most cases HUNDREDS of $1,000’s of dollars in future tax deductions whilst owning the investment property for many many years to come . This simple fact alone should be enough to make the right decision but what if you desperately want to move out of your parents place or stop paying rent? Okay so now I had Kate’s attention – she was clearly a money savvy girl as she was already saving really well – so when I showed her the simple above math, she was very interested in learning more. I then went on to explain that this doesn’t mean she couldn’t take advantage of the FHOG and buy a new property to live in for a couple of years – as long as she purchased with the intention of leveraging the property in the future for investment purposes. Basically, this means that you buy a property that 99% of people will either want to buy or rent in the future. Properties with good community infrastructure (shops, schools, public transport etc), good floor plans and similar. Saying no to student accommodations or bungalows and yes to houses, townhouses and apartments. Buying a property that you know you will easily find future tenants or buyers after a few years THUS allowing you to tap into the equity and leveraging into your next purchase. More equity equals more power. More power equals more opportunities. I would rather you use the tax man and tenants to pay off your investment purchases and grow your portfolio rather than your hard-earned money in a forever home that just has a long list of expenses. When you take this approach to entering the property market; you have access to more wealth faster; SO when that dream home does come across your path, you’re ready! However if you’re sick of waiting – you have the financial power to build it from scratch yourself. Do you have a young person in your life that you’re desperate to move out of home get into the property market? If yes, let’s make a time to chat all together and make a plan they can implement! Give me a buzz on 1300 736 754 and let me answer all those burning questions you have!